Acting and being seen to act with the highest level of integrity is a vital component of my core values and beliefs. John Blondin has been a Media proprietor and publisher of B2B, Consumer and Custom magazines for 30 years. He is a fellow of the Australian Marketing Institute (FAMI) and a Certified Practising Marketer (CPM). As founding Managing Director of The National Publishing Group he published award winning magazines in hospitality, business and sport. He led his team to win many awards including Best Consumer Magazine, Best Magazine Launch, Best Specialist Publication and in 2004 the major Publishing Award being, Magazine of the Year. 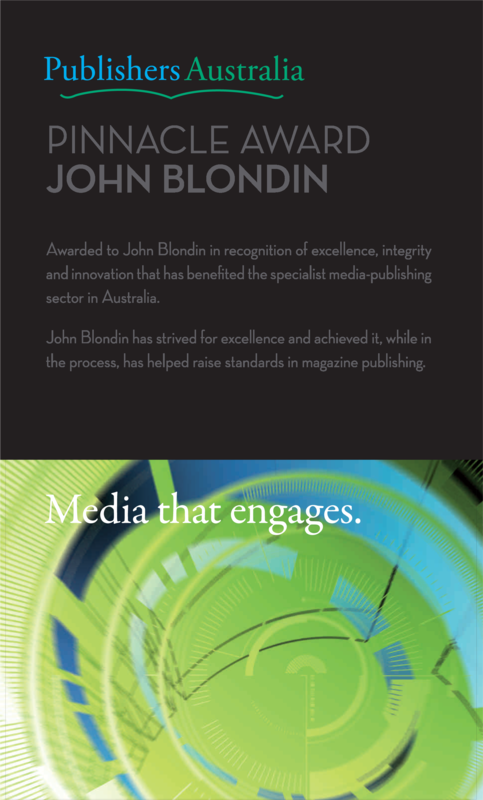 In 1995 John was awarded the Australian Marketing Institutes National Award for Marketing Excellence in Media Strategy and Planning and was honoured with a Fellowship of the Institute. John is a former Chairman of Publishers Australia, and a Board Member for over ten years. In 2011 he was inducted into the Publishers Australia Hall of Fame. He is CEO of Media Titles Pty Ltd ,a media consultancy, also owning media related communication assets. He was Chairman of New Zealand’s Media Titles Group Ltd, publishers of sports titles until it’s sale in 2013. The assets included contracts with NZ Rugby Union, NZ Cricket Association and ANZ Netball Championships. The company published over 20 print/digital magazines and newsletter brands in Australia, New Zealand and globally online. John now specialises in Marketing and Media consultancy. His focus being the M&A sector supporting and developing the processes as they relate to media asset sales as well as assisting in the marketing and sales process.